Take the 109 – Ranee North bus from Lawrence West Station. This will take you through to Ranee Avenue and let you off on Wasdale Drive and Bathurst Street. Walk a 1/2 block South to Baycrest Centre. Exit at Avenue Road. Take Wilson Avenue west to Bathurst. Take Bathurst St. south to Baycrest Avenue making a right turn at Baycrest Avenue and enter Baycrest property at the first right. Wait at the Khedive Entrance (and receive your pass: see next page) before following signs to the parking lot. Another alternative to Baycrest travelling eastbound on the 401 is to exit at Dufferin Street. Travel south on Dufferin Street to Ranee Avenue. Take Ranee Avenue east to Ameer Avenue. Turn left (north) on Ameer Avenue past two streets, Regina Avenue and Sultana Avenue. The next street is Baycrest Avenue. Turn right and pass Rahja Street to Khedive Avenue and enter Baycrest property through second driveway on left. Wait at the Khedive Entrance (and receive your pass: see next page) before following signs to the parking lot. Exit at Bathurst Street onto Wilson Avenue. Turn right onto Bathurst Street and travel south on Bathurst to Baycrest Avenue. Turn right on Baycrest Avenue and enter Baycrest property at the first right. Wait at the Khedive Entrance (and receive your pass: see next page) before following signs to the parking lot. Visitor parking is available outside the Brain Health Complex building for $6.25/hour. Please let us know in advance via email if you will be parking. On the days of your testing, you will meet a research staff at the Khedive entrance (see map) 15 MINUTES PRIOR to the time you are scheduled to start testing. We will meet you in your vehicle at the Khedive entrance and provide you with a parking pass for the Main parking lot only. NOTE: The parking pass is ONLY VALID FOR THE MAIN PARKING LOT. If you park in other lots, you will be ticketed. 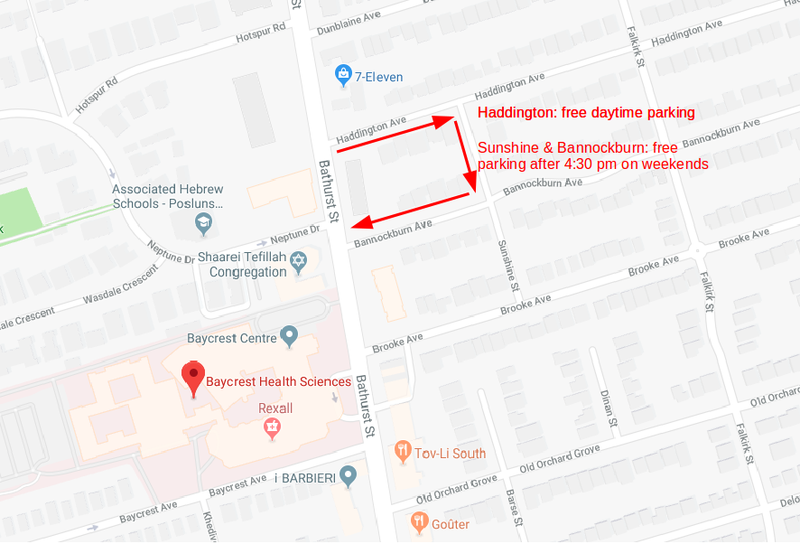 Baycrest’s main parking lot is located at the back of the hospital (see map – marked as ‘main lot’).YOU MUST PARK ONLY IN AREAS NOT MARKED AS ‘PERMIT ZONES’ (as indicated by green), otherwise you will be ticketed. You may NOT park in the area indicated by red. Free street parking can be found in the side streets near Baycrest, eg. Baycrest Avenue, Haddington Avenue, Bannockburn Avenue, etc. Some parking is open during the day, while others are only available on evenings and weekends. See map below.